It was a season that began with them facing their toughest competitor, the Ashburn Xtreme, in their first CBHL league game. It also began with a 5-3 win - handing Ashburn their first league game loss in a very long time. 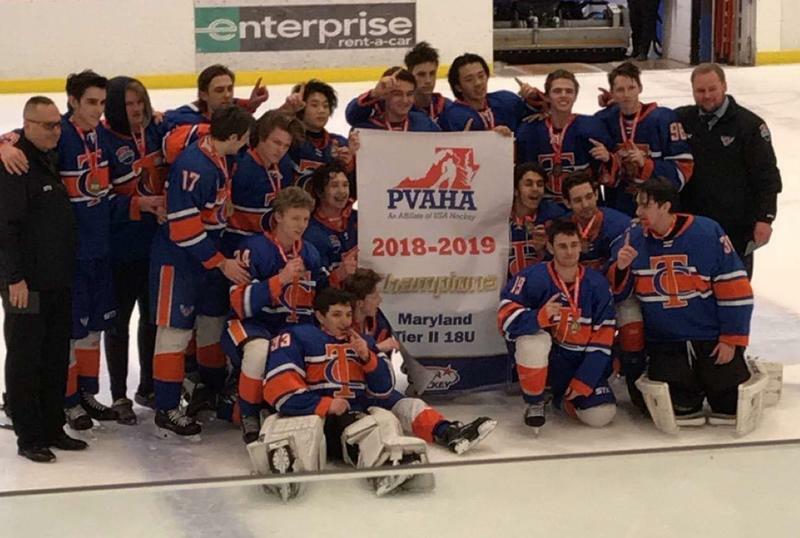 Beating Ashburn that first game of the season was a moment to remember for Coach Kellen Henderson, the first -year head coach of the 18U Blue. "Not knowing what to expect and realizing that the win meant we had something very special to build upon, is something I'll never forget," said Coach Henderson. Getting a travel team ready to compete at the AA level is always a challenge. With TCE's new split-season development model, allowing for high school -age players to better handle playing on travel and high school teams, it was a big job to keep the team's focus and connection strong during the once per week practice schedule November through January. Coach Henderson ultimately credits the new development model with the team being healthy and having the legs to make a big push in the CBHL playoffs. Additionally, he credit the team's leadership with bringing an already great group of smart and hardworking players together on and off the ice. Captains' Tyler Pearson, Juraj Bystriansky, and Kevin Cottrell alongside Henderson and assistant coach Jim Rudnick worked very well together and enjoyed a roster of players that loved playing as a team. Henderson says, "I'm incredibly proud of this great group of guys- their speed and resilience on the ice, especially at the end of a long season has shown that if they want something, they possess the skill and intensity to make it happen. I'm also lucky to have had the mentorship of TCE Assistant Hockey Director Rob Trantin in my last two years assistant coaching and the level-headed, calm demeanor of Jim Rudnick to balance my intensity this season." "It's amazing to think we've already enjoyed a season where we started and ended with wins against Ashburn- you really can't do it any better but I'm looking forward to taking this team to Nationals and seeing how we can finish up." Last year the 18U Blue team finished third in their conference at National- topping that will be hard but if anyone can do it, it's this team! Good luck to 18U Blue in San Jose.